Gitterns, a small plucked guitar were the first small like guitar instruments created during the Middle Ages with a round back like that of a lute. Guitar like shaped instruments where not seen until the Renaissance era where the body and size began to take a guitar like shape. The earliest string instruments that related to the guitar and its structure where broadly known as the vihuelas within Spanish musical culture. Vihuelas where string instruments that were commonly seen in the 16th century during the Renaissance. Later, Spanish writers distinguished these instruments into 2 categories of vihuelas. The vihuela de arco was a bow like structured instrument that mimic-ed the violin, and the vihuela de penola which was played with a Plectrum or by hand. When it was played by hand it was known as the vihuela de mano. Vihuela de mano shared extreme similarities with the Renaissance guitar as it portrayed hand movement at the sound hole or sound chamber of the instrument to create music. The Real production of guitars kicked off in France where the popularity and production first began increasing with large quantities. Spain became the homeland of the guitar but there's very little information on the early makers there, unlike France, where many inventors and artists first began overproducing these instruments and its music. 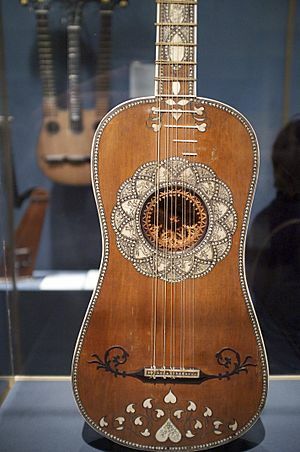 By 1790 only six-course vihuela guitars (6 unison-tuned pairs of strings) were being created and had become the main type modeled guitar used in Spain. Most of the older 5-course guitars where still in use but were also being modified to a six-coursed acoustical guitar. The acoustic guitar at this time really began to take its shape with extreme similarities to the acoustic guitar today with the exception of the coursed strings which later where removed for single strings instead of pairs. By the 19th century, coursed strings where evolved into 6 single stringed instruments much like that of the guitar today. It had evolved to that of our modern look except for its size still retaining a smaller frame. A Gibson SJ200 Steel-string acoustic guitar. The acoustic guitar's soundboard, or top, also has a strong effect on the loudness of the guitar. No amplification actually occurs in this process, because no external energy is added to increase the loudness of the sound (as would be the case with an electronic amplifier). All the energy is provided by the plucking of the string. But without a soundboard, the string would just "cut" through the air without actually moving it much. The soundboard increases the surface of the vibrating area in a process called mechanical impedance matching. The soundboard can move the air much more easily than the string alone, because it is large and flat. This increases the entire system's energy transfer efficiency, and a much louder sound is emitted. In addition, the acoustic guitar has a hollow body, and an additional coupling and resonance effect increases the efficiency of energy transmission in lower frequencies. A guitar has several sound coupling modes: string to soundboard, soundboard to cavity air, and both soundboard and cavity air to outside air. The back of the guitar also vibrates to some degree, driven by air in the cavity and mechanical coupling to the rest of the guitar. An Ovation Adamas, whose parabolic shape reduces feedback and increases volume. Classical gut-string guitars had little projection, and so were unable to displace banjos until innovations increased their volume. Two important innovations were introduced by the American firm, Martin Guitars. First, Martin introduced steel strings. 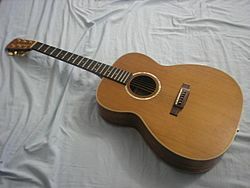 Second, Martin increased the area of the guitar top; the popularity of Martin's larger "dreadnought" body size amongst acoustic performers is related to the greater sound volume produced. These innovations allowed guitars to compete with and often displace the banjos that had previously dominated jazz bands. The steel-strings increased tension on the neck; for stability, Martin reinforced the neck with a steel truss rod, which became standard in later steel-string guitars. An acoustic guitar can be amplified by using various types of pickups or microphones. However, amplification of acoustic guitars had many problems with audio feedback. The most common type of pickups used for acoustic guitar amplification are piezo and magnetic pickups. Piezo pickups are generally mounted under the bridge saddle of the acoustic guitar and can be plugged into a mixer or amplifier. In the 2000s, manufactures introduced new types of pickups to try to amplify the full sound of these instruments. This includes body sensors, and systems that include an internal microphone along with body sensors or under-the-saddle pickups. Historical and modern acoustic guitars are extremely varied in their design and construction, far more so than electric guitars. Some of the most important varieties are the classical guitar (nylon-stringed), steel-string acoustic guitar and lap steel guitar. Acoustic guitar Facts for Kids. Kiddle Encyclopedia.